Note: 1. Spelled as two words, Side Show, in most publicity, but occasionally as Sideshow. 2. Marie Eline also played a circus midget in a later Thanhouser film, Taming Their Grandchildren, September 9, 1913. "Her parents were humble peasants and were fond of her when she was a baby, for they believed she would grow up to be a beautiful woman and make a good match. The trouble was she didn't grow up. When she was 19 she was no bigger than a child of six, and the parents bitterly lamented the fact. Naturally they were overjoyed when an offer for their daughter's hand was made by another midget who lived in the same little village. To their astonishment and anger, the girl refused to entertain it, declaring the husband she chose would have to be a man of whom she could be proud. Her home life was most unhappy after that, and the entire family rejoiced when a showman from the United States arrived and offered what seemed to be big money if she would join his 'Congress of Freaks,' which was quite an institution in America. And the girl went gladly. In a strange new life, she found many things to wonder at, and one object to admire, to wit, the loveliest, biggest, jolliest giant she had ever dreamed of. Naturally she fell deeply in love with him, but he never even suspected it. The reason was that his giantly affections were all expended on the glorious snake charmer, whom he hoped to make his bride some day. The midget, who thought her affections were returned, was disillusioned, and her romance shattered. Then the little man from across the sea crossed to America, and renewed his suit. She was won by his devotion, and accepted him, realizing that they would be happy, far happier than she would have been with the giant. It is hard enough for a woman to manage an ordinary man, but how can she hope to control a big hulking husband, when one snort of disapproval by him would blow her and her orders to the four winds of Heaven?" "Scores of amusingly entertaining picture plays have been made by the Thanhouser Company, but this is the oddest and most novel of them all. 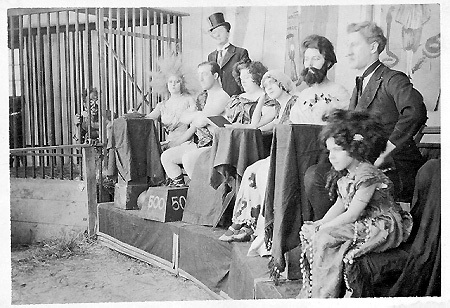 The members of the company, including the 'Thanhouser Kid,' who is featured in the offering as a midget; Bertha Blanchard, David Thompson, Carl LeViness, May Carr, Mignon Anderson, Fanny Gregory and Robert Milasch appear as freaks of a circus side show and their queer impersonations reflect the highest credit on them all. The story is assuredly entertaining. The girl midget, supposedly of European birth and home, is urged to wed another tiny mite, but refuses, and then joins a freak show where she falls in love with a big giant. But the latter loves a bearded lady and this almost breaks the heart of the little woman. But her midget lover follows her to American shores and renews his wooing, this time successfully, and thus is the play brought to an ending happy for all. Children will revel in it and grown-ups will enjoy it heartily." "The star of the side show is 'the Thanhouser Kid' - little Marie Eline - who takes the role of a midget. In the early scene she is a little Dutch woman in sabots, who refuses a proposal of marriage from a neighbor, also a midget. She joins the show and has a very amusing flirtation with the show's giant. He is sick with love for the serpent charmer, and she feels the pain of jealousy; but the other midget also comes to the show, and we have a pretty wedding ceremony. It is something fresh, new and delightfully amusing. It makes a very good feature. The photographs are fine." REVIEW, The New York Dramatic Mirror, April 10, 1912: This review is reprinted in the narrative section of the present work.